The world’s eight richest individuals own as much wealth as the poorest half of the world’s population. It is no wonder we have high expectations of philanthropy. Join us for a conversation on the evolving role of philanthropy around the world. 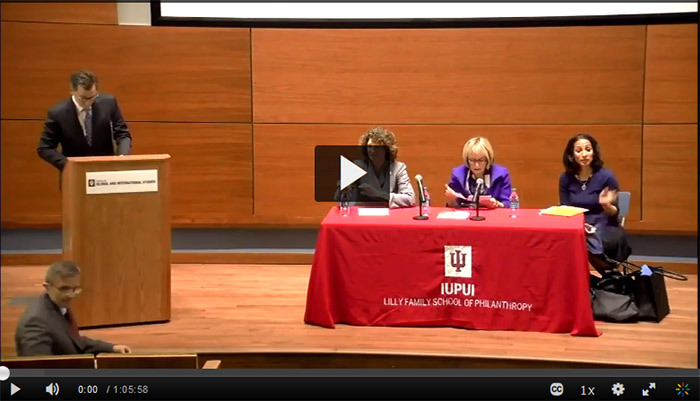 Our discussion, in partnership with the School of Public and Environmental Affairs and the School of Global and International Studies, will engage Indiana University’s world leading researchers on philanthropy as they describe how wealth is being put to work to address key social issues around the world. How is philanthropy making an impact in different countries, both advanced and developing economies, and across borders? What are the emerging trends and issues to consider as philanthropy is expected to make more of an impact? Our conversation will be moderated by IU’s First Lady Laurie Burns McRobbie and will feature Dr. Carol Adelman, the creator of the Global Philanthropy Indices and visiting research professor, and Dr. Una Osili, associate dean for research and international programs, both at the IU Lilly Family School of Philanthropy where Laurie McRobbie received her master’s degree in philanthropic studies. As IU’s 18th First Lady, Burns McRobbie champions the philanthropic spirit among IU’s alumni with a particular focus on the growing importance of women’s philanthropy. She is a founder of the Women’s Philanthropy Leadership Council at the Indiana University Foundation and serves as its honorary chair. In 2012, she was named Woman of the Year by the City of Bloomington’s Commission on the Status of Women, and in 2014, she was given the Leading Light Outstanding Leadership Award by the Indianapolis-based organization Women & Hi Tech. 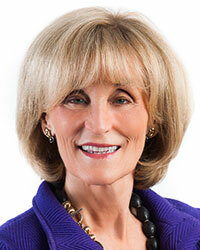 Burns McRobbie brings broad experience with research universities to her role. A technologist in higher education for more than 25 years, she served in numerous management and executive positions at the University of Michigan and as an executive director with Internet2. She helped found and lead Internet2’s Gender Diversity Initiative, which has sponsored scholarships and travel grants for women technologists and network engineers, as well as a major survey of gender diversity in employment. Burns McRobbie holds an adjunct faculty position in IU’s School of Informatics and Computing, where she helped found the ServeIT service-learning clinic. She played a crucial role in the establishment of the Indiana University Center of Excellence for Women in Technology (CEWiT) at IUB, which seeks to create, foster, and improve academic and professional opportunities for women students, faculty, and staff working in or with technology. IU’s First Lady serves on numerous boards both locally and nationally, including the Community Foundation of Bloomington and Monroe County and the community advisory board for Bloomington’s Academy of Science and Entrepreneurship. Burns McRobbie serves as president of the Board of Directors for the 2017 Indiana Conference for Women and was appointed by the Governor to the Indiana Arts Commission in July 2017. Carol Adelman, Ph.D., visiting research professor, is senior fellow at the Hudson Institute and the founder and former director of its Center for Global Prosperity. She founded the Index of Global Philanthropy and Remittances and the Index of Philanthropic Freedom, widely cited studies now produced by the school. The former assistant administrator of the U.S. Agency for International Development (AID), Dr. Adelman holds a Ph.D. and master’s degree in public health from John Hopkins University and a master’s degree in foreign service from Georgetown University. Una O. Osili, Ph.D., is an economist with significant experience in research and policy in the fields of household behavior and economic policy. She is also associate dean for research and international programs at the Indiana University Lilly Family School of Philanthropy, the world’s first school dedicated to increasing the understanding of philanthropy and improving its practice worldwide. An internationally recognized expert on economic development and philanthropy, Dr. Osili speaks across the globe on issues related to national and international trends in economics and philanthropy. She testified at the U.S. Senate subcommittee on the role of philanthropy and remittances in foreign aid and has been quoted by international and national news media outlets such as The New York Times, Financial Times, the Wall Street Journal and the Chronicle of Philanthropy. She has served as a member of several national and international advisory groups, including the African Development Bank, Social Science Research Council, the United Nations Economic Commission for Africa and the United Nations Development Program. 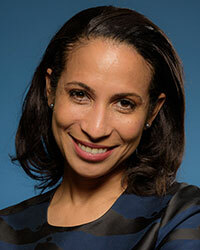 Dr. Osili leads the research and publication of Giving USA, the annual report on American philanthropy. Beginning in fall 2016, she has led the research and publication of Index of Global Philanthropy and Remittances and Index of Philanthropic Freedom. She has pioneered new approaches to using data to better understand global and national trends in philanthropy with the Million Dollar List and the new Generosity for Life project. She directs the school’s research program with its partners including Bank of America, United Way Worldwide, Coutts Inc, and National Collegiate Athletic Association. She has served as an associate editor for the Journal of African Economies and guest editor of the Journal of African Development. She earned her B.A. in Economics at Harvard University, and her M.A., and Ph.D. in Economics from Northwestern University.